2017 Year-End Tax Planning for Businesses - POKCPA - Palius + O'Kelley CPAs Inc.
As year-end approaches, each business should consider the many opportunities that might be lost if year-end tax planning is not explored. Your business may even want to consider several general strategies, such as the use of traditional timing techniques for delaying income recognition and accelerating deductions. You may also consider customized strategies tailored to your business’s particular situation. President Trump ran on a platform of consolidating and reducing individual tax rates. 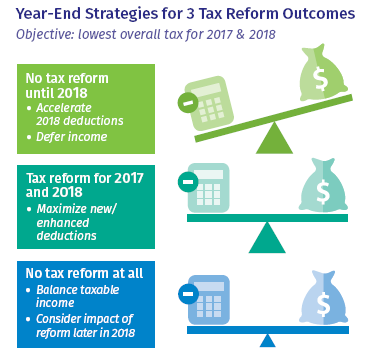 The Trump/GOP “framework for tax reform,” released in late September, would reduce the maximum corporate rate to 20 percent, eliminate the federal estate tax and the alternative minimum tax (AMT), as well as limit the maximum tax rate applied to the business income of small and family-owned businesses conducted as sole proprietorships, partnerships and S corporations to 25 percent. It will likely remain unclear until late November or early December whether tax reform will happen before the end of 2017, and if so, whether the law changes will be temporary or permanent and whether they will be prospective or retroactive. • Section 179 Deduction: For 2017, the maximum Section 179 deduction is $510,000 (assuming property purchases for the year do not exceed $2,030,000). Therefore, an eligible business can often claim first-year depreciation write-offs for the entire cost of new and used equipment and software additions and eligible real property costs. Note: Watch out if your business is already expected to have a tax loss for the year (or close) before considering any Section 179 deduction, as you cannot claim a Section 179 write-off that would create or increase an overall business tax loss. Also, you might want to consider delaying purchases in excess of $510,000 until next year as it is possible that next year’s expensing allowance could be even more generous. Please contact us if either of these situations applies to your operation. • First-year Bonus Depreciation: Above and beyond the Section 179 deduction, your business also can claim first-year bonus depreciation equal to 50% of the cost of most new (not used) equipment and software placed in service by 12/31/17. Note that 50% bonus depreciation deductions can create or increase a Net Operating Loss (NOL) for your business’s 2017 tax year. You may then carry back the NOL to 2015 and 2016 and collect a refund of taxes paid in one or both of those years. Please contact us for details on the interaction between asset additions and NOL’s. The bonus depreciation rate is scheduled to drop to 40% for property placed in service in 2018. If your business doesn’t already have a retirement plan, now might be the time to take the plunge. Current retirement plan rules allow for significant deductible contributions. Even if your business is only part-time or something you do on the side, contributing to a SEP-IRA or SIMPLE-IRA can enable you to reduce your current tax load while increasing your retirement savings. With a SEP-IRA, you generally can contribute up to 20% of your self-employment earnings, with a maximum contribution of $54,000 for 2017. A SIMPLE-IRA, on the other hand, allows you to set aside up to $12,500 for 2017 plus an employer match that could potentially be the same amount. In addition, if you will be age 50 or older as of year-end, you can contribute an additional $3,000 to a SIMPLE-IRA. If you’re age 50 or older as of year-end and your business has no employees, a solo 401(k) can allow for a contribution of up to $60,000. Inventory is normally valued for tax purposes at cost or the lower of cost or market value. Regardless of which of these methods is used, the end-of-the-year inventory should be reviewed to detect obsolete or damaged items. The carrying cost of any such items may be written down to their probable selling price (net of selling expenses). However, please note that this rule does not apply to businesses that use the Last in, First out (LIFO) method because LIFO does not distinguish between goods that have been written down and those that have not. If you own an interest in a partnership or S corporation, your ability to deduct any losses it passes through is limited to your basis. Although any unused loss may be carried forward indefinitely, the time value of money diminishes the usefulness of these suspended deductions. Thus, if you expect the partnership or S corporation to generate a loss this year and you lack sufficient basis to claim a full deduction, you may want to make a capital contribution (or in the case of an S corporation, loan it additional funds) before year-end. Note: The Bipartisan Budget Act of 2015 (BBA) established a new audit regime for partnerships that will go into effect in 2018. The BBA regime creates new roles and responsibilities for partners. To avoid future disagreements, it is recommended that partnership agreements be reviewed by competent legal counsel and revised as needed. In light of all this, it is important to evaluate the ways these tax rules could impact your tax liability. So, please contact our office now so we may discuss the specific 2017 year-end strategies that might be particularly worthwhile for your business.